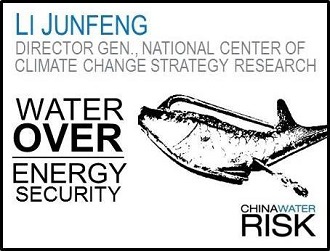 Li Junfeng is the Director General of the National Center of Climate Change Strategy Research at the National Development and Reform Commission. Mr. Li facilitated the implementation of the national high technology program for wind and solar PV within the 11th five-year plan, and was one of the chief authors of the Chinese Renewable Energy Law. He has engaged in renewable energy project development for GEF, the World Bank and the UNDP, and also led the development of the first CDM project in China as well. He holds professional and academic positions as a Professor and the Chair of the Academic Committee of ERI and the President of Chinese Renewable Industrial Association. Li Junfeng is one of China’s most prominent advocates of renewable energy, actively addressing the importance of water security in the public. He is currently the Director General of National Center of Climate Change Strategy Research and the former Deputy Director of the Energy Research Institute at China’s National Development and Reform Commission. These two roles put him in a unique position to look at China’s energy mix from a broader context and its link with water risks. At the Eco Forum Global Annual Conference held in Guiyang in 2014, he delivered a strong argument saying that “water security is more important than energy security”, which was widely quoted by Chinese media. On August 29, China Water Risk sat down with Li Junfeng in Beijing and he shared his views with us on China’s water-energy nexus and the importance of water security. China’s Water Risk (CWR): You have been actively addressing the importance of water security with regards to energy security. What makes you think “water security is more important than energy security”? Li Junfeng (LJF): China has been suffering from nationwide shortage of energy and water resources. Water security and energy security are both important and closely related. However, water security is more important. It’s more complex, and needs more attention. China’s oil demand can be met by importing 60% of its oil from other countries; but it wouldn’t be possible to ensure freshwater supply in this way – it would be unsustainable if a highly populated, global manufacturing country like China imported 10% of its water demand. CWR: China is currently undertaking an ambitious energy transformation plan. One of the most urgent tasks is to cut its coal use by half by 2050. Will limited water resources shape this reduction in coal? LJF: For China, whether it is in a “high coal demand era” or “low coal demand era”, energy and water are inevitably linked. For future planning of energy mix, water must be taken into consideration as an important factor. The current plan is to reduce 1% of coal use whilst increasing the same proportion of alternative energy use each year. Coal mining, coal washing, coal plants, cooling, dust precipitator and processing slag all require a lot of water. So people assume cutting down coal use saves huge amounts of water. However, we should bear in mind that some types of alternative energy also require large water consumption. Take shale gas as an example: China plans to reach 400 billion cubic meters of shale gas and natural gas production per annum by 2030. This extraction process would require at least 15 billion cubic meters freshwater per annum. Both gas-fired and coal-fired power plants are also big water consumers in China. Even wind power and solar power are also water consumers. CWR: As you said, whether traditional or new, all energy needs water, so does the reduced share of coal in the energy mix result in less water consumption in energy production? And what’s your estimation of water consumption before and after changing the national energy mix? LJF: I haven’t performed comprehensive calculations on this and am not aware that others have made such analysis as the outcome very much depends on the energy mix. If more renewable energy were to be used, the water consumption should be reduced significantly. However, if natural gas or nuclear were to be used to replace coal, the water consumption may largely remain the same or even increase as natural gas extraction and cooling nuclear station consumes even more water than coal. In addition, the type of technology such as cooling used in different types of power generation also makes a difference to water consumption. CWR: So limited water resources will indeed shape not just coal but China’s future energy plan? LFJ: Water availability is critical to China’s current restructuring of its energy mix. Coal and coal-to-chemical industries largely rely on water. No water, no coal and no coal-to-chemical industries. Same for nuclear power – huge demand of cooling water significantly limits nuclear power expansion making coastal areas more preferred than inland areas. The sea will hardly dry out, but China’s inland rivers and lakes have already experienced great depletion. The water availability will greatly impact the future selection of energy types and their locations. CWR: We see that water availability has been factored in for coal expansion. Has this translated to the whole national energy plan? LJF: Not yet… we used to take water resources for granted. China has been describing itself as a country short of land and energy but rarely do we hear that we are water scarce. In fact, water resources in China are not abundant; moreover they are also not being effectively utilized. But the situation is changing. At the central government level, Premier Li Keqiang has declared “war” on water pollution, air pollution and soil pollution. The National Development and Reform Commission is also working on the “Water Pollution Prevention & Control Action Plan”. This is a very positive signal from the top. CWR: There is increasing scientific evidence on the impact of climate change on water distribution across China. Will this influence future decision making in terms of energy planning? LJF: For decision makers, geographical water availability limits the location of energy projects in the short term. New energy projects should clearly take into account future water demand both for operational and emergency needs. In the long run, energy distribution should consider the impact of climate change and changing climate patterns. According to recent studies by scientists from both China and abroad, the current “flood in the South and drought in the North” pattern might gradually reverse and become “drought in the South and flood in the North”. The process will be slow but will have a significant impact on China’s energy planning for the next 20 to 30 years. CWR: Should climate patterns shift between the North and the South, does it mean that water-intensive energy projects that are currently located in water stress regions might get more water; while hydropower and nuclear power projects that are mostly in the south might have less water in the future? LJF: It is possible. Therefore, for provincial decision makers, coal-fired power plant planning needs to consider future water availability. If the water supply will likely decrease, no more plants should be built. Nuclear is another example. A nuclear power plant has an operational lifespan of around 60 years, long enough for it to be exposed to impacts from climate change. Current nuclear plants in operation are all located in coastal provinces such as Guangdong. Future nuclear power expansion plans to locate some of the new plants to inland provinces like Anhui and Jiangxi, with the hopes of drawing water from the Yangtze River and the Poyang Lake. But is there really enough water in the long term? I doubt that. We have already witnessed flow interruptions in the Yellow River as well as the depletion of the Poyang Lake. CWR: Speaking of nuclear, some proposed plants have faced resistance from the public. There is also a stronger anti-nuclear voice across the country. How do you see the future of nuclear power development in China? LJF: Well, in my view, if we are not building more nuclear power plants now, it will be more difficult to build them in the future. The future of nuclear power also depends on the future development of other alternative energies. If wind power and solar energy continue to grow fast, there would be less space for nuclear power. Cost is another factor. More stringent environmental requirements have increased the cost to develop nuclear power, making it less competitive compared to others. For instance, in the US, after the big decline of shale gas extraction cost, no one is willing to invest in new nuclear power plants. Within China, there are lots of debates going on. Those who support nuclear power claim that China will not be able to achieve energy security without nuclear power development. But is this true? China plans to develop 70-300GW of nuclear power by 2020 and 2030, whilst total power installation will reach 1,900GW to 2,000GW by 2020 and 2,700GW to 3,000GW by 2030. So nuclear power will only account for around 10% of the total demand, making it optional rather than essential. CWR: On hydropower, the 12FYP approved quite a few large-scale hydropower projects in the Southwest. Where do you see hydropower heading? LJF: The past decade was the golden age for hydropower in China, but the next decade will see an end to this boom. In essence, China’s hydropower development is “a spent arrow”. Hydropower is no longer rapidly growing; 80% of China’s available hydropower resources have already been developed. China’s hydropower capacity has reached 250GW and is expected to increase to 350 GW in the future. Hydropower development should likely reach its final stage by 2025 and by 2030 China’s massive hydropower construction should be finished. CWR: What about the planned large-scale hydropower expansion on transboundary rivers such as the Yarlong, Nu & Lancang Rivers. Without comprehensive water sharing agreements in place, such projects may give rise to geopolitical tensions in the region. What are your views? LJF: They are very unlikely to be developed. Many of these projects are proposed to be built in areas with extremely complex geological conditions, some even in extremely unstable zones with high risk of earthquake. To build hydropower in those areas it requires great care. As I said, the “golden age” for hydropower has passed. From a political perspective, the high-level decision-makers are also more and more aware of the importance of environmental protection. Former Premier Wen Jiabao approved much fewer hydropower plants during his second term than his first term. Change is slow, but it is happening. CWR: So what do you think China’s optimum future energy mix should look like? LJF: It is hard to predict, but we do have lessons to learn from other countries. We need to “walk on two legs”: one is to accelerate the development of non-fossil fuels, and the other is to make fossil energy cleaner. For China, the most important is to have a balanced energy mix. I am not opposed with nuclear power, but as I said, nuclear development will only make up a small portion of total energy needs. We need to keep developing solar, wind, hydro and natural gas and eventually shift to non-fossil energy sources. Natural gas may be a good option during the transition period. However, such period could last as long as more than 50 years. Unlike electronics, advancement in energy technologies takes a longer time – at least five years to achieve a tiny progress. With regards to China’s future energy plan, we need to increase energy efficiency and save energy at the same time. Actually this is a must-do. We must ensure China’s economic development stays within both its environmental capacity and energy capacity. Approvals should be only given to projects with limited impacts on the environment and energy security. No more water-intensive energy projects should be implemented. Every new power plant should have an accurate accounting of water usage before construction. This should be in the form of an accurate quantitative analysis which addresses exactly how much water will be used, the source of withdrawal and trade-offs with other important competing needs such as agriculture. Every construction project should be required to provide a water supply plan and contract. Take Ningxia province as an example; new coal plants in the Ningdong Coal Base wanting to use water-cooling technologies, must find water sources to meet their demand. In reality, water quotas in Ningxia province are almost used up, leaving little water allocation for newcomers. New plants therefore, have no other choice but to adopt the most advanced water efficient technologies or switch to air-cooling. Elephants in the Room – With coal-fired power plants and hydropower doubling by 2020, Debra Tan discusses coal, financing the power build out and dams. Is a fundamental shift required to work round these elephants?